A new Metroid title may not have been revealed at E3 this year, but it has been announced that a new Metroid game should be ready for an official reveal sometime “in the near future”. In a recent Kotaku interview with Shigeru Miyamoto and Shinya Takahashi, the topic of Metroid came up. Stephen Totilo, Kotaku: I can’t ask you what’s going on with Pikmin, because you’ve answered that for the last couple of years in a row. I can’t ask you what’s going on with Star Fox, because you answered that this year. 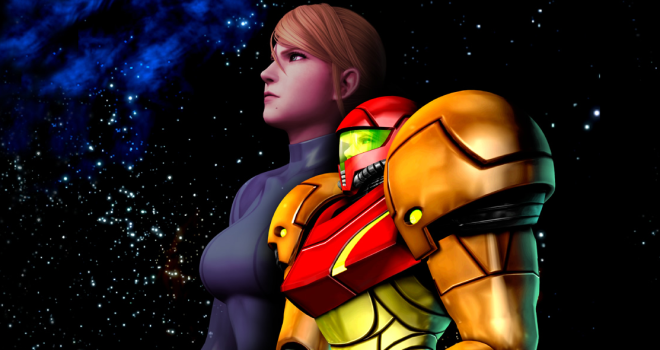 So… what is going on with Metroid? Shigeru Miyamoto, Nintendo: The original creators of Metroid and the director who was the director of the Metroid Prime games who worked under me when I was producing those both now work for Mr. Takahashi, so you’ll have to ask him. Shinya Takahashi, Nintendo: So it has been a while since we released the last one and we’re having discussions internally about what we can do next. So at this point we have two different types of Metroid games. We have the Prime style of Metroid game and we have the more traditional style of Metroid game. We feel that we do need to take care of both of these styles of play. And the hope is that at some point in the near future we’ll be able to share something about them. Miyamoto: This falls into your question before of remaking the same franchises. Totilo: I’ll get back to that in a second, but which of the two styles do you guys like better? The 2D or Metroid Prime? Takahashi: I like them both. They both have a different style of appeal. Miyamoto: I have the New Super Mario Bros. series [for 2D], so I like Prime. I think there’s still a lot of new things that could be done with the Prime series. Nintendo has stated that a new Metroid title was coming to the Wii U, but now it looks like we’ll be getting two different titles. I’m guessing that the Metroid Prime style game will be for the Wii U and the 2D style game will be for the 3DS. Hopefully we’ll get more information in a Nintendo Direct relatively soon.